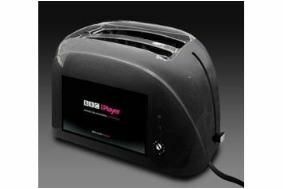 BBC develops iPlayer toaster with OLED display | What Hi-Fi? The boffins at the Beeb have developed yet another application for the iPlayer, in the form of a toaster with built-in, 7in OLED display on the side, capable of streaming programmes from the iPlayer. It has built-in wi-fi, allowing you to stream your favourite iPlayer TV and radio programmes direct to the toaster's front panel. So you can catch-up on the previous night's TV over the breakfast table, while munching a nice slice of toast. Audio is provided by two heat-proof speakers concealed within the toaster slots, and the touch-sensitive display is protected from the heat by special thermal insulation. Don't believe us? Check it out on the BBC's official internet blog.